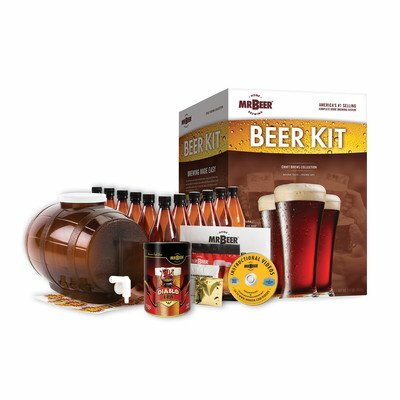 Mr. Beer Diablo IPA Complete Homebrewing Kit provides aspiring brewers with patented brewing equipment and high quality ingredients that simplify the homebrewing process. Patented brewing system includes a compact, lightweight fermenter that is modeled after the design of professional brewing equipment. (11) 25 Oz. reusable and shatterproof bottles are specially designed for carbonating beer. Includes a can of brewing extract - a concentrated form of all natural malted barley and hops - produced in a state-of-the-art facility. Also includes a no-rinse cleanser and unique carbonation drops to simplify the sanitization and carbonation process. Kit includes Diablo IPA refill - a fiendishly hopped American IPA that displays a blend of floral spice and stone fruit aromas - and features a firm yet balanced bitter finish. The Product is manufactured in United States.